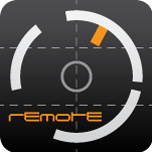 Setlist mode allows you to control the Kronos exactly as you’d be using the Kronos touchscreen in setlist mode. But it’s more convenient to scroll smoothly through your setlist instead of switching pages. 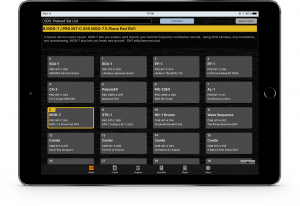 Moreover we offer a special mode that allows you to keep viewing the setlist on your iPad but switch the mode of the Kronos. You select a combi in setlist mode and have immediate access to the mixer and all subpages on the Kronos touchscreen, while the App still shows your setlist and lets you switch to a Program or Song, which will then toggle the instrument mode on the Kronos. 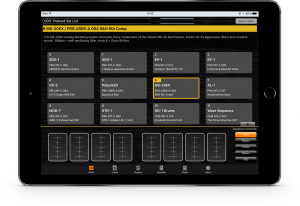 An additional bar at the bottom of the screen is available to give you access to several sets of realtime controllers featuring among others 8 pads, the 8 sliders and knobs from the Kronos realtime surface and the ribbon controller. The bar is rather small to keep the setlist slots in reach, if you need full access to the realtime controllers there is a dedicated ‚Controllers‘ mode in the bottom main navigation bar.